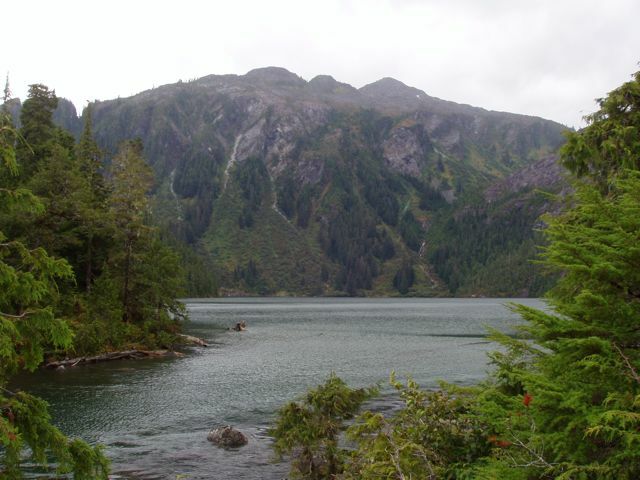 After leaving Sitka, we returned through Peril Strait and continued south down Chatham Strait and along the east side of Baranof Island to Baranof Warm Springs Bay. 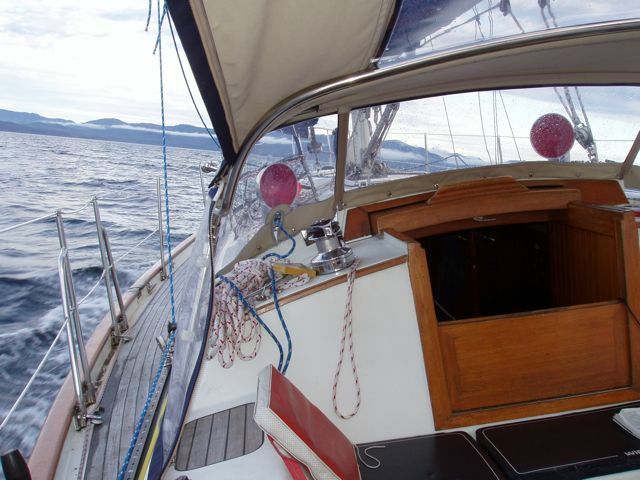 Under sail in Chatham Strait, on the way from Peril Strait south to Warm Springs Bay and Baranof. The view south down Chatham Strait. 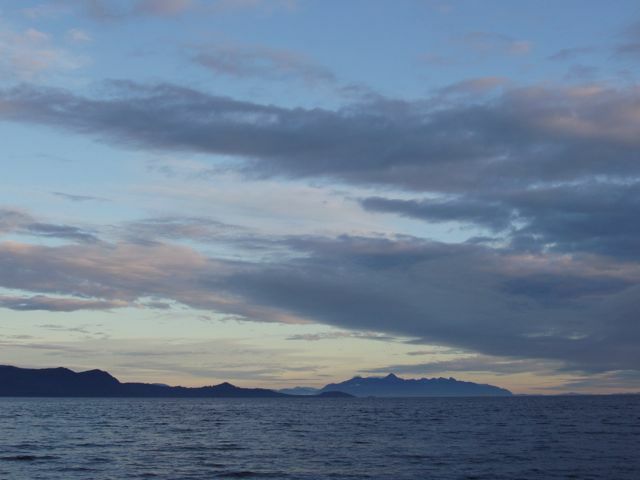 The southern tip of Admiralty Island is on the left, Kuiu Island in the distance. 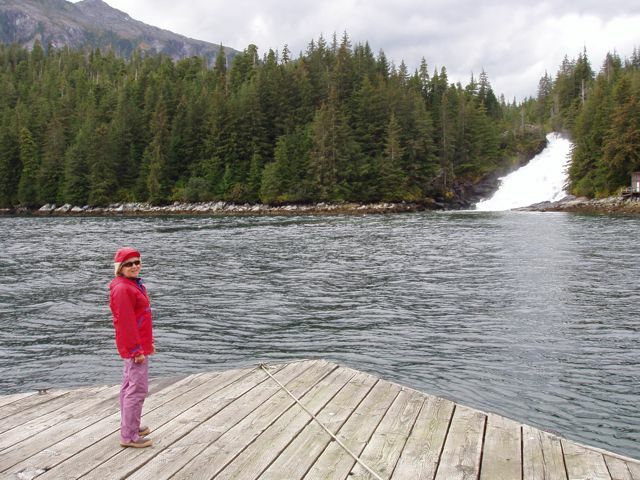 Conni on the dock in the tiny community of Baranof, the waterfall on the right. Even though the chart said "prominent falls", we didn't expect this gusher. 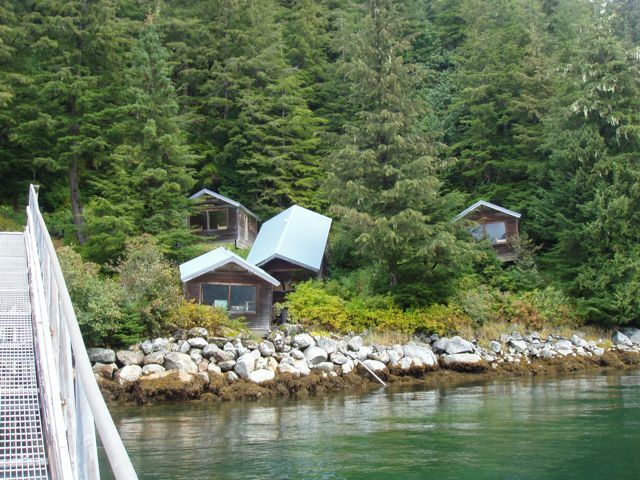 Want to buy a cheap cabin in Alaska? Foundation not provided. 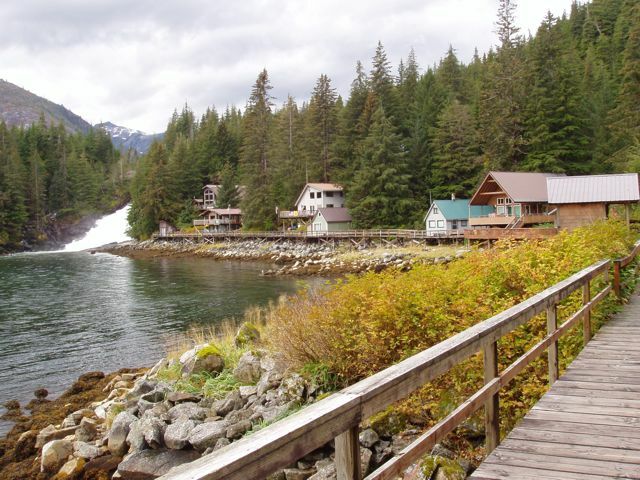 The tiny, and we do mean tiny, but pretty community of Baranof. Except for a couple houses tucked into the trees, this is the entire town. 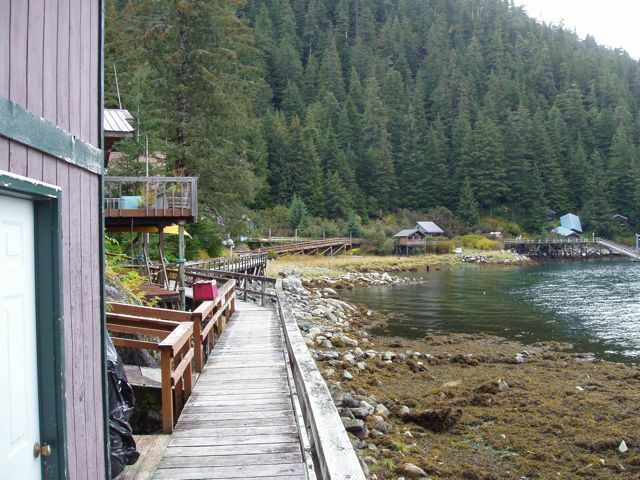 The "main street" connecting the cabins in Baranof. Those cheap cabins are on the right. 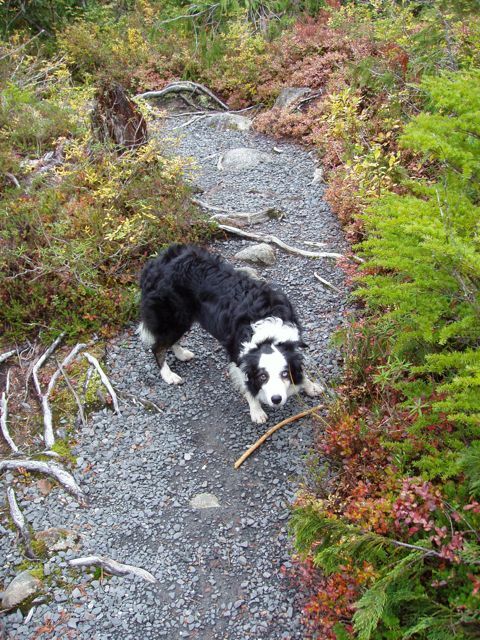 "Stick dog" greeted us on our walk to the springs and insisted on playing fetch. This one's for you, Jonathan Galin. Note the size limits: 14 inch minimum? For a cutthroat? And I can have 2? 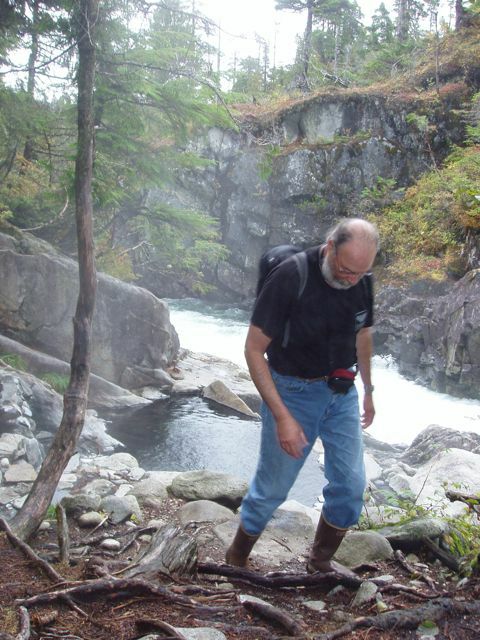 Why didn't Bill pack a flyrod? 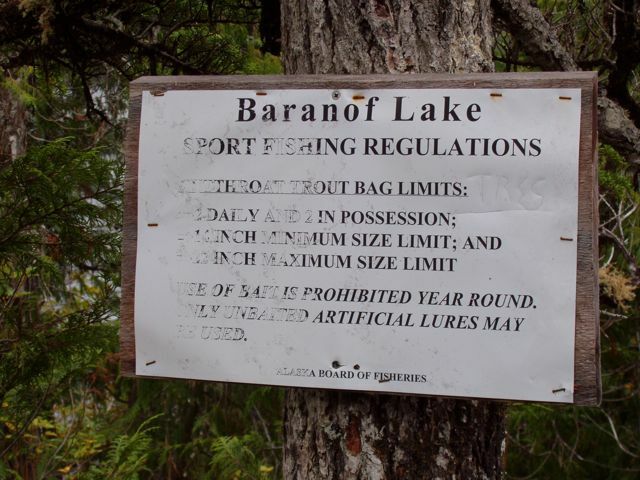 Baranof Lake. Very, very pretty. 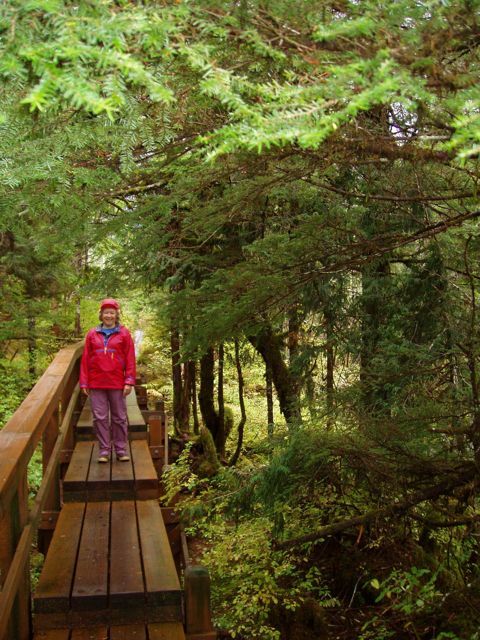 Conni on the fancy part of the Forest Service boardwalk to Baranof Lake and the warm springs. The upper pool at the warm (actually pretty hot) springs, with the top of the falls just beyond. Bill checking the temperature of his bath water (not that he needs one.) You can see the upper and lower pools, and the top of the falls just beyond. 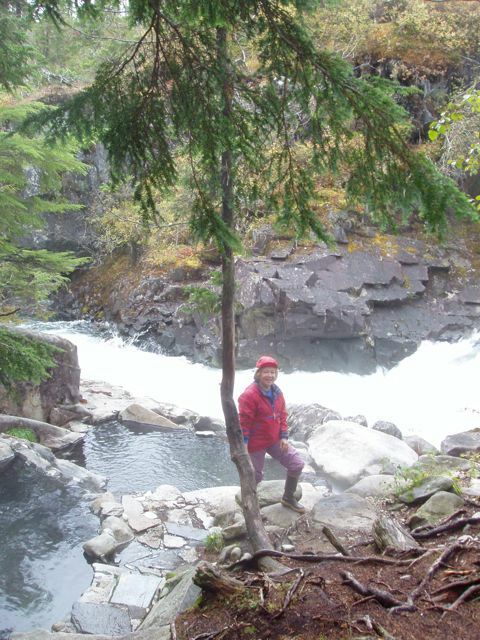 Conni by the warm springs pools and the falls. 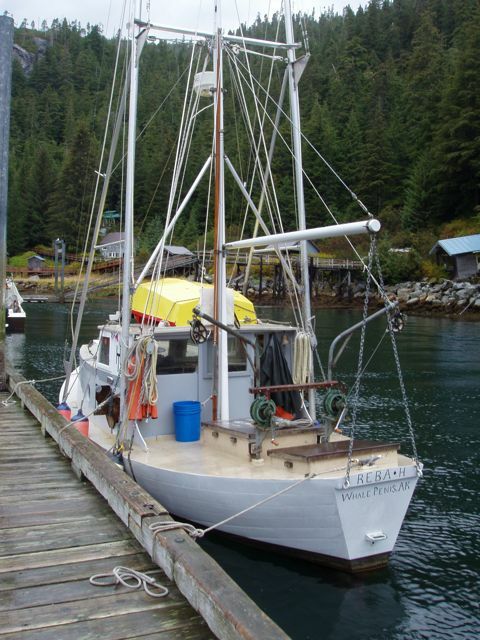 The leaping gnome of Baranof. 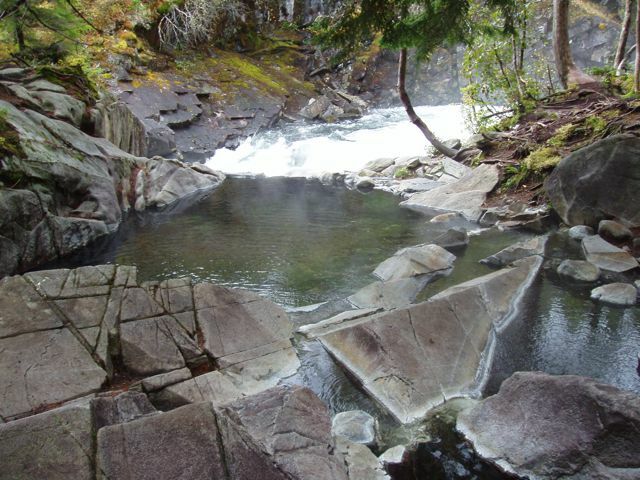 The pools are fed by several hot springs tucked into the woods, each of which has been rimmed with concrete. 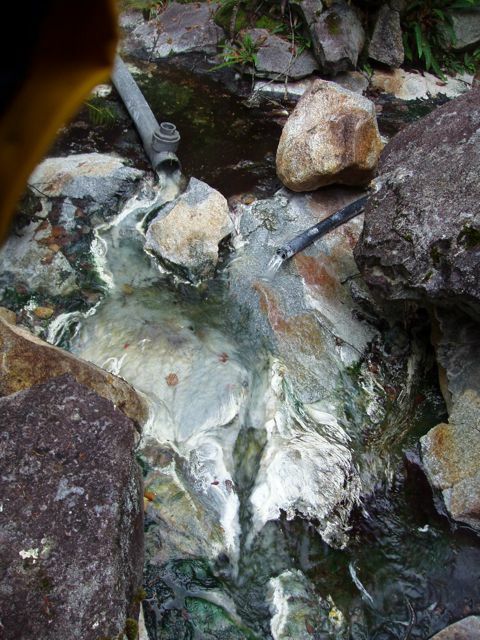 Note the bubbles of the spring water, as well as the silver algae that seem to grow in hot, sulphurous water. 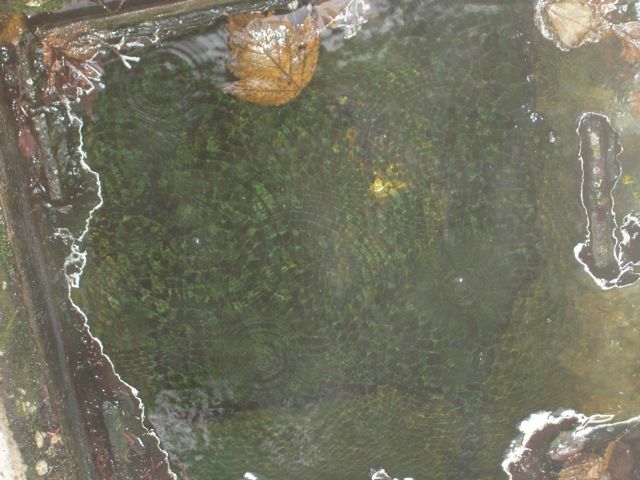 We saw this algae in Tenakee Hot Springs as well. Pipes from two of the springs feed this sulphur-ey creek. Note the masses of silver algae on the rocks. 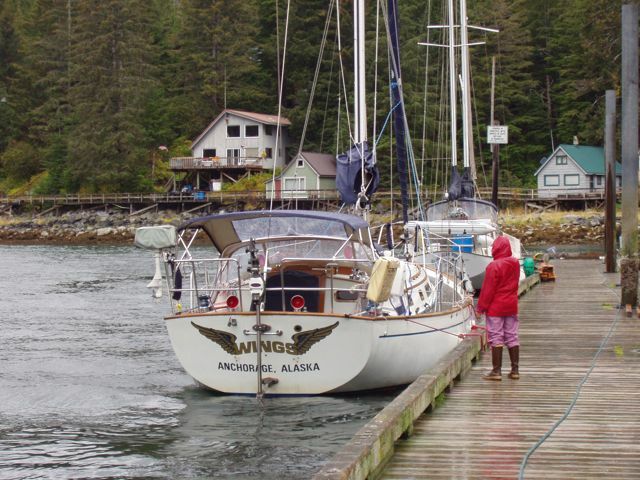 Wings at the public dock in Baranof. 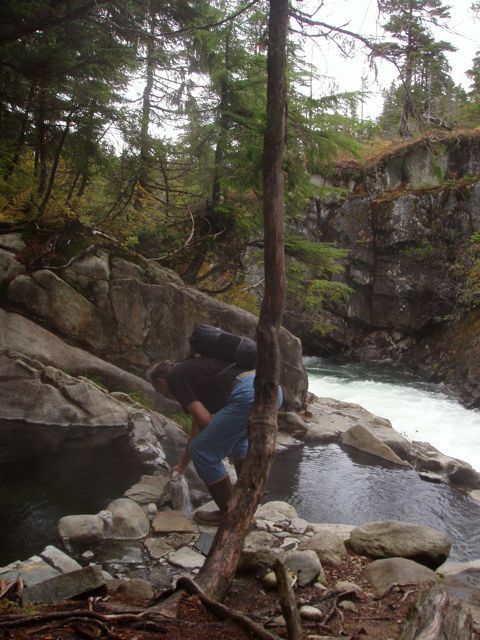 There is a strong current by the dock, from the falls outflow. Uh, Reba H, where did you say you were from? 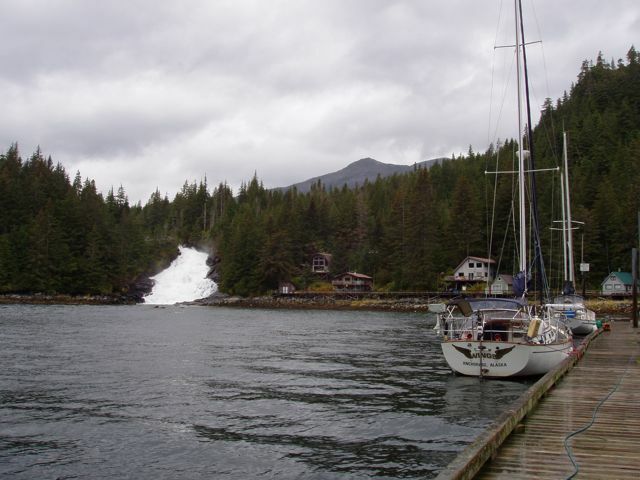 Conni by Wings at the dock in Baranof, with the water swirling behind the stern.